I’m on parenting duty again this weekend, so no badger watching. But there’s always something wildlifey to be seen out there. Take these tracks for instance. They appeared overnight in Scarlett’s sandpit (yes, I really have used my daughter’s plaything as an impromptu tracking box. The scale is in centimetres, so the tracks are small. I’m thinking they’re from a mouse from the size and the trail pattern. 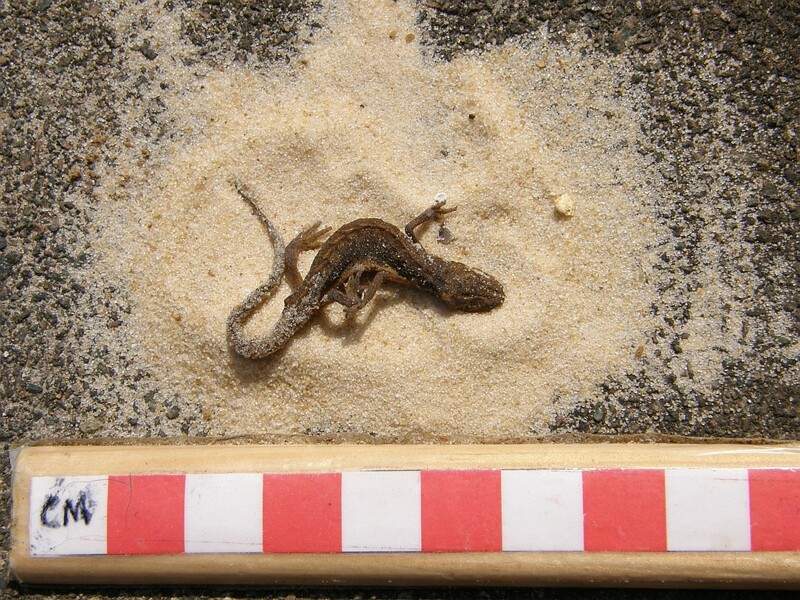 These tracks have alternate footprints and an obvious tail-drag. 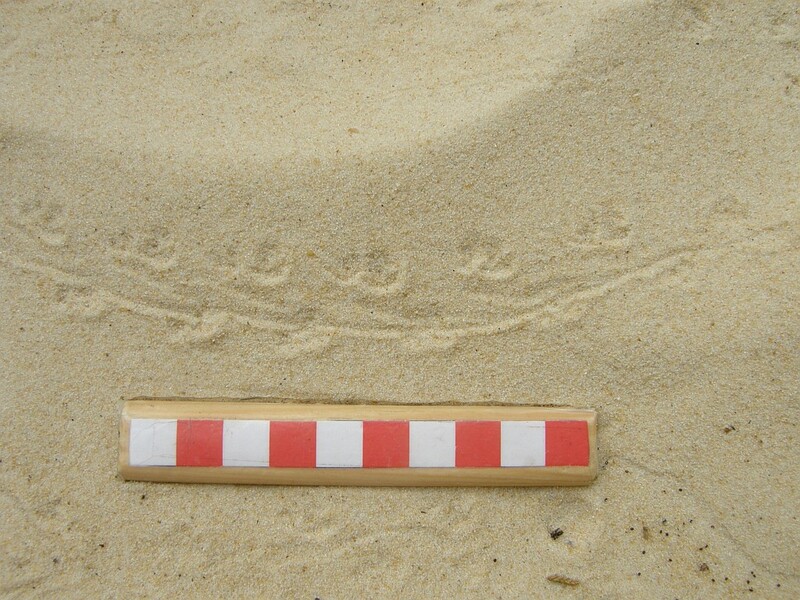 The guidebooks are a little unclear on mouse tracks: some say that a tail-drag is present, others not, and the gait of a mouse can be either walking (alternate tracks) or jumping (parallel tracks). Since I can’t think of anything else that could have made them, I’m going for mouse anyway. We were accompanied on the walk by a Green Woodpecker that kept flitting ahead of us, from treetops to the ground and back again. I’ve seen these in the garden a few times, but oddly, I’ve never seen one in the wild, even though I hear their distinctive ‘yaffle’ call most times I visit the wood. This one was obliging enough to pose for a long-range photograph. The highlight of our little walk came as we headed back home. 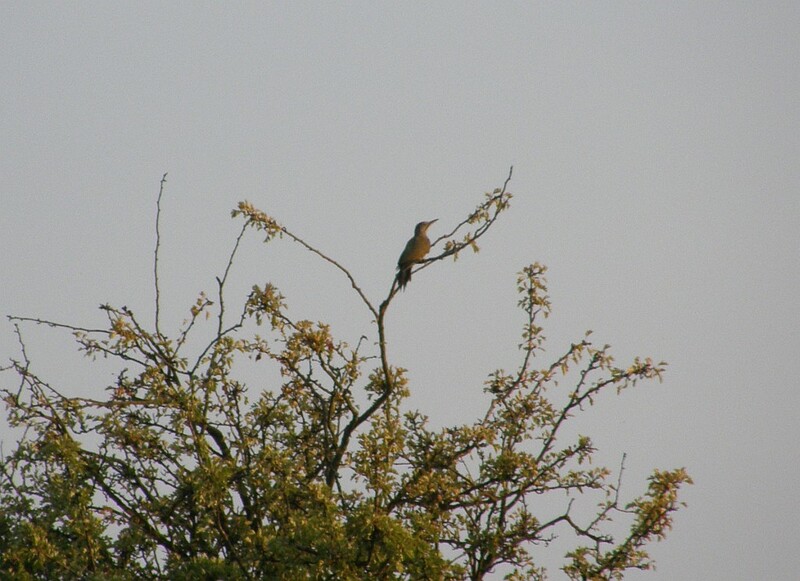 A sparrowhawk flew past us along the lane, swooping below the level of the hedgerows on either side. Gripped in its talons was a sparrow-sized bird – it had obviously just caught it and was taking it to secure place to pluck and eat it. A splendid sight, and one that made me glad I’d got outside, even if it was just a brief walk. It rained on Sunday. I can’t remember the last time I saw rain, it’s been that long. Nevertheless, we went for a little walk in the field behind my house. 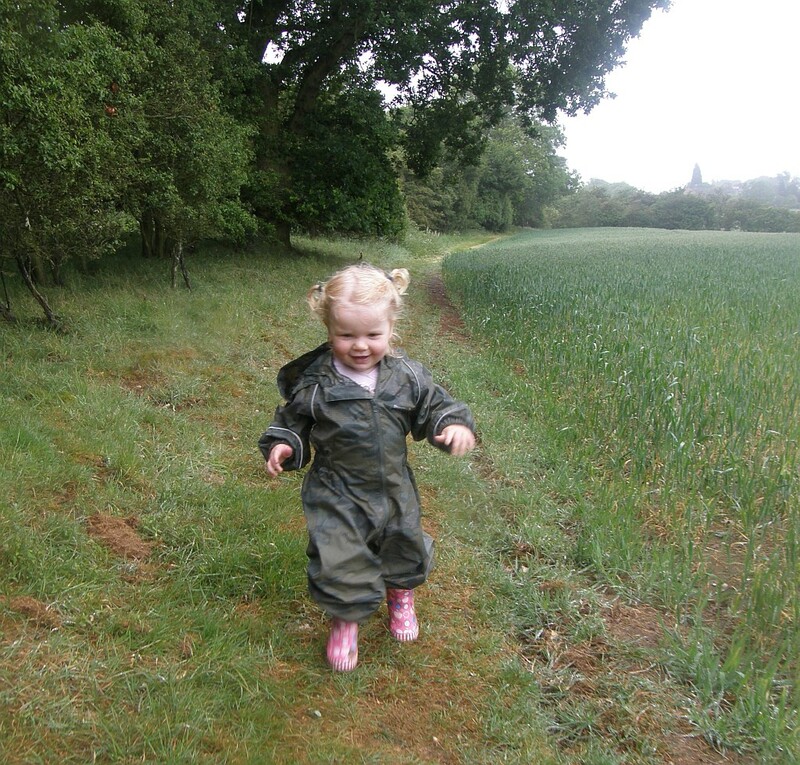 It was a bit soggy for the wildlife, only the odd rabbit and a muntjac barking in the copse. 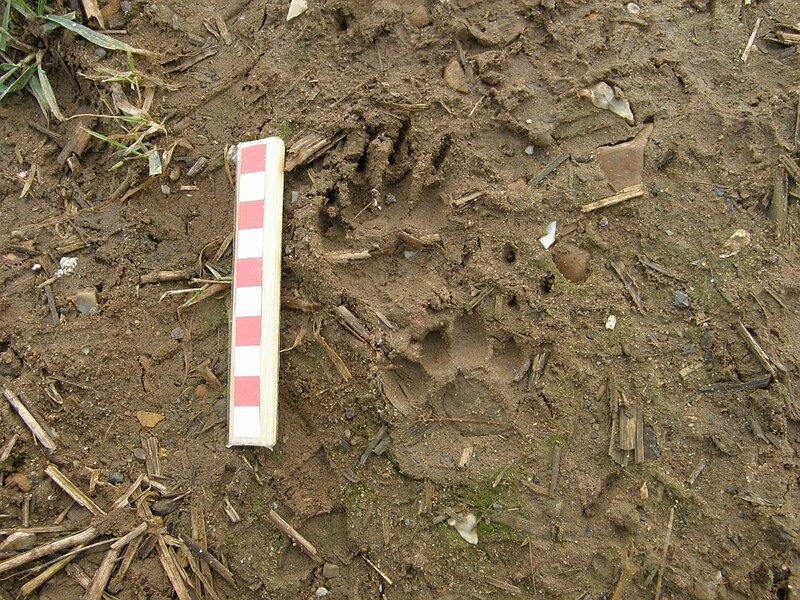 The persistent rain had washed out any tracks, but that doesn’t mean there was nothing to be seen. There was a little whodunnit mystery in the wheat. CSI Bedfordshire, if you will. 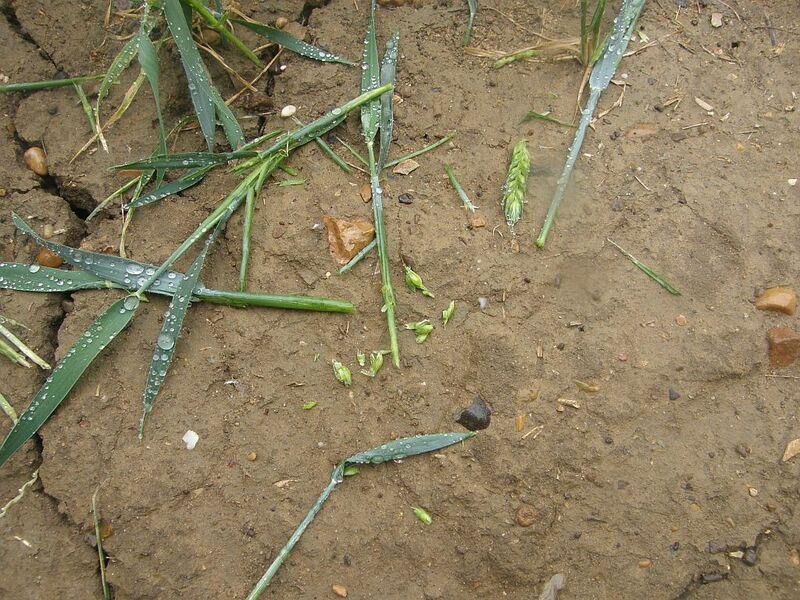 Some animal had been eating the wheat stalks and stripping the green corn from the ears. 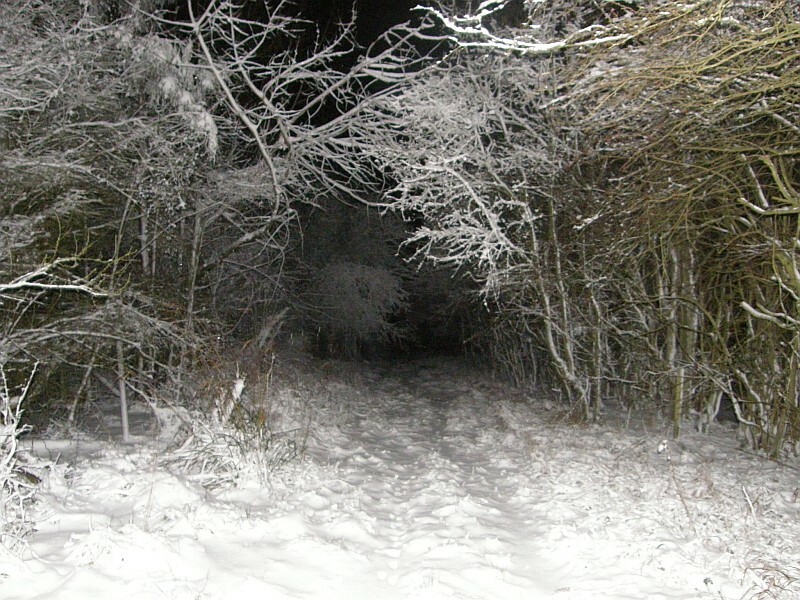 The evidence was lying on the path, but there were no tracks to be seen. Can we tell what animal did this? The first rule in tracking is to think about what is possible and probable. Think about the species that are known to be in the area first. Whatever had eaten the wheat was a herbivore, but we can eliminate anything too exotic. Our local herbivores are mice, voles, rabbits and hares, and deer of various species. The field had no domestic species such as sheep or cows so we can rule them out too. 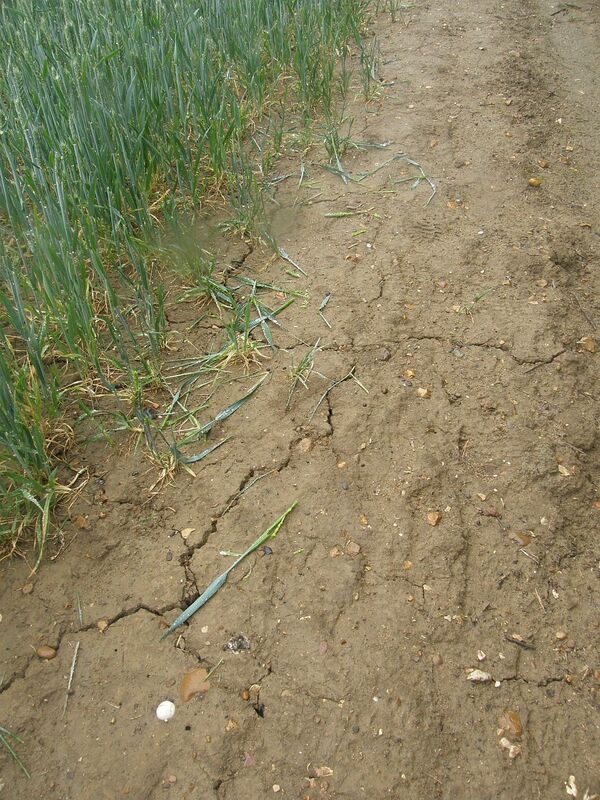 Voles and mice were a possibility – they are definitely to be found in this field, but the stalks were bitten off too high for such small animals. That leaves rabbits, hares and deer. Examining the stalks of wheat revealed that they had been chewed off rather than bitten cleanly. It’s a little detail, but important. Rabbits and hares are (sort of) rodents and have incisor teeth in both upper and lower jaws that meet like scissors. They snip off vegetation cleanly. They wouldn’t leave a mangled stalk like this. Deer, on the other hand, have incisor teeth in the lower jaw only, and a horny pad on the upper jaw. They can’t bite as cleanly as rabbits and tend to tear what they eat. 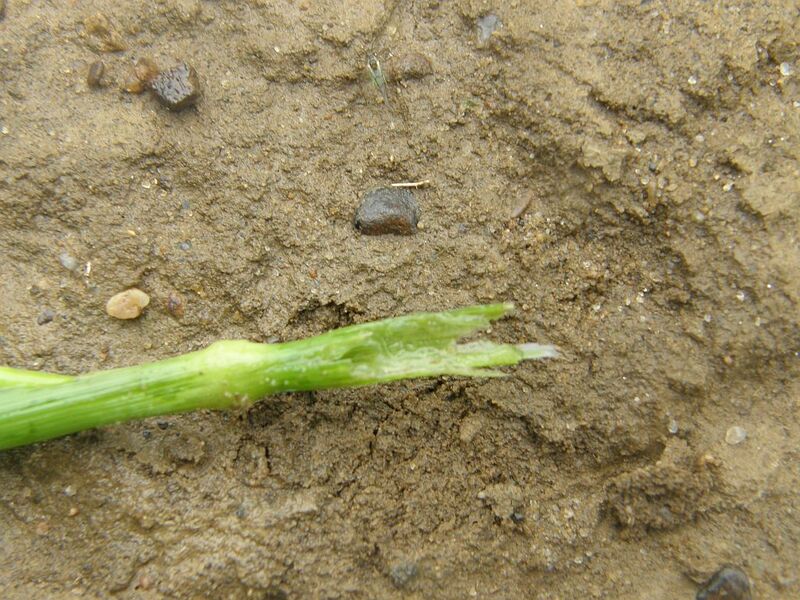 This wheat stalk is characteristic of a deer. I’ve mentioned this before, but the village I live in has a connection to some of the most courageous polar expeditions in history. The frozen ends of the earth are a long way from our green fields and woods and hedgerows, but I like to think I’m keeping the polar tradition alive by going outside every time it snows. It snowed a couple of weeks ago and I was looking forward to going out tracking, but unfortunately it all melted by the weekend and I didn’t get the chance. Today, however, we’ve had another good fall of snow – four inches or so in the space of the afternoon. The whole of the UK has once again ground to a halt (it took Mrs BWM three and half hours to drive home from London today, on what is normally a one hour journey) but I’m happy. It’s snowed, it’s Saturday, it’s time to go out tracking. It’s been a while since I’ve been outdoors, so it felt good to take out my camouflage jacket, put on my walking boots and pick up my tracking stick from its place behind the back door. It sounds odd, but I always enjoy walking in winter. 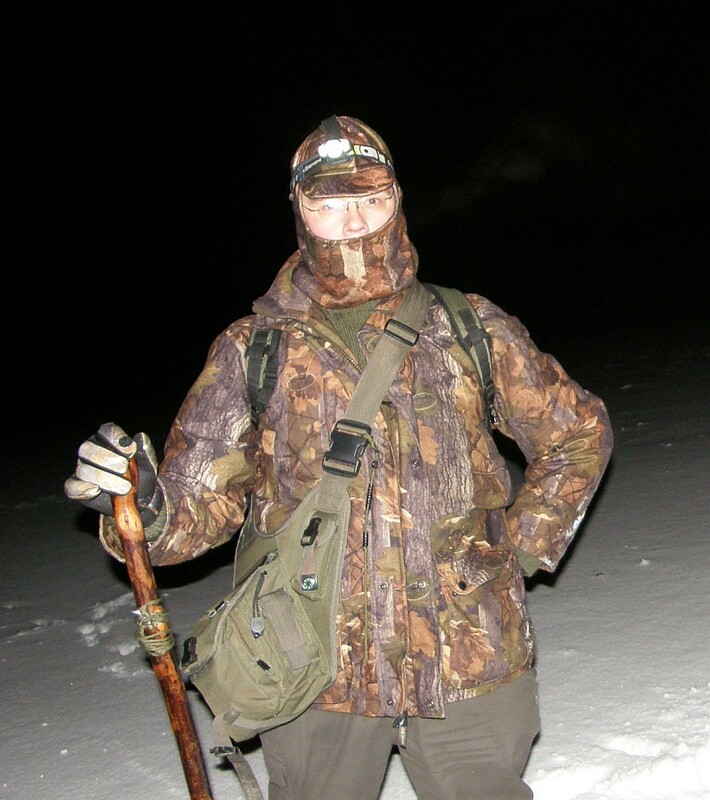 There is a satisfaction in getting dressed up and going out into the cold, meeting the challenge of the conditions. As luck would have it, I bought myself a new piece of kit on Thursday – a windproof fleece balaclava. I suspect it makes me look even more scary than usual, but it really does keep my ears and neck warm. The temperature tonight was minus 3 or so, which meant that the snow was still fresh and powdery, the snow-covered fields eerily bright in the moonlight, almost as clear as day. I headed up to the pasture field in the hope of tracking the badgers there. 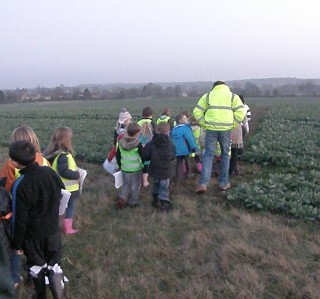 I’ve had some fascinating times following the badger trails here – following the tracks of badgers for hundreds of yards and seeing how the trails interact with each other. The snow provides a wonderful record of badger behaviour that would normally be invisible. BWM in heroic 'Polar Explorer' pose. Note the smart new balaclava. Alas, tonight did not reveal anything about badger behaviour. In fact, there were no badger tracks at all. A few rabbit tracks, and the fresh trail of a fox trotting across the footpath, but no badgers. I was out at 9.00 to 10.00pm, so perhaps the badgers had not come out yet. It might be the case that they are staying underground at the moment – I know that badgers will venture out and forage in snow, but this snow comes after a few days of hard frost. A hard frost makes it much harder for the badgers to dig for worms, so it may be that the frozen ground has had more of an effect on them than the snow. I’ll go out again tomorrow and see if there have been any new tracks overnight. Even without badger tracks it was still a fine night to be out. Despite the chaos that it brings, I hope we get more snow. If it carries on into next week I’d like to build an igloo in the garden and really make the most of it. Here’s another piece in the jigsaw puzzle of my tracking the stoats in my neighbourhood. I took a stroll through the field behind my house this evening. I didn’t see any stoats, and my carefully smoothed patches of loose sand showed no clear tracks. But I did find something very interesting indeed. It goes to prove my maxim – ‘there’s always something to see, even when there’s nothing to see’. What I found was a patch of black feathers, evidently from a crow. 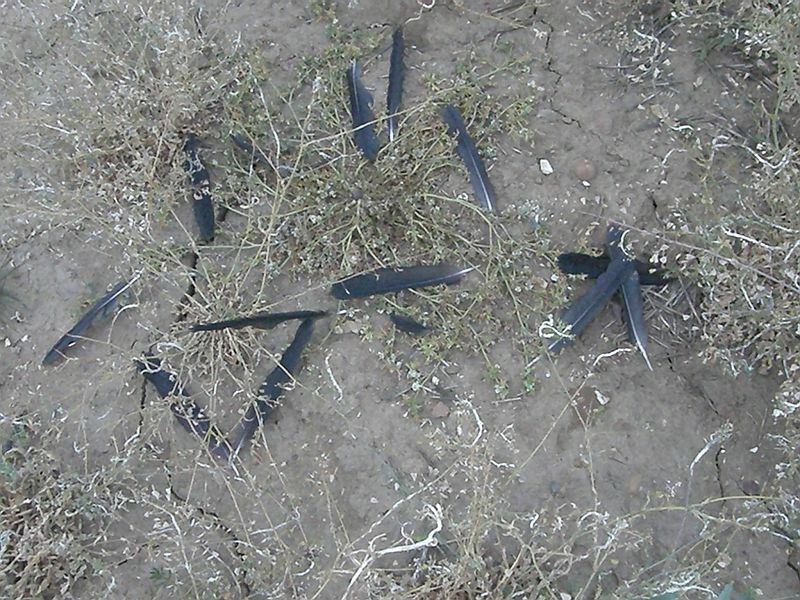 The crow had obviously met a sudden end to have lost this many feathers, presumably from a predator of some sort. Nothing too unusual there – we have a lot of crows around here. But can we tell what predator was responsible? A close look at the feathers gives us a clue. The quills of many have been bitten off cleanly near the bottom. A look through the guidebooks when I got home confirmed my suspicions. A bird of prey will remove the feathers from a bird that it has killed, but it does so by grasping them in its beak and pulling them out. The feather gets mangled, but otherwise stays in one piece. 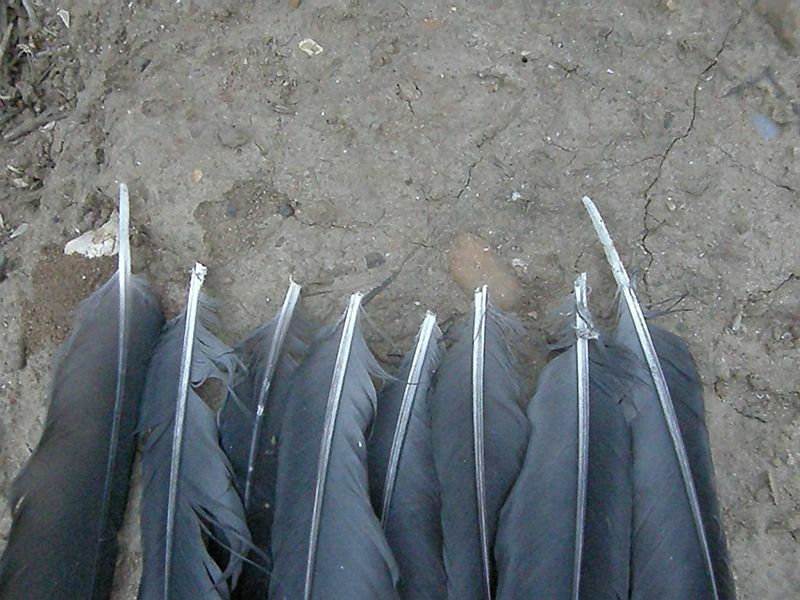 These feathers were bitten off so it was no bird of prey that did this. No, the guidebooks were clear on this point. 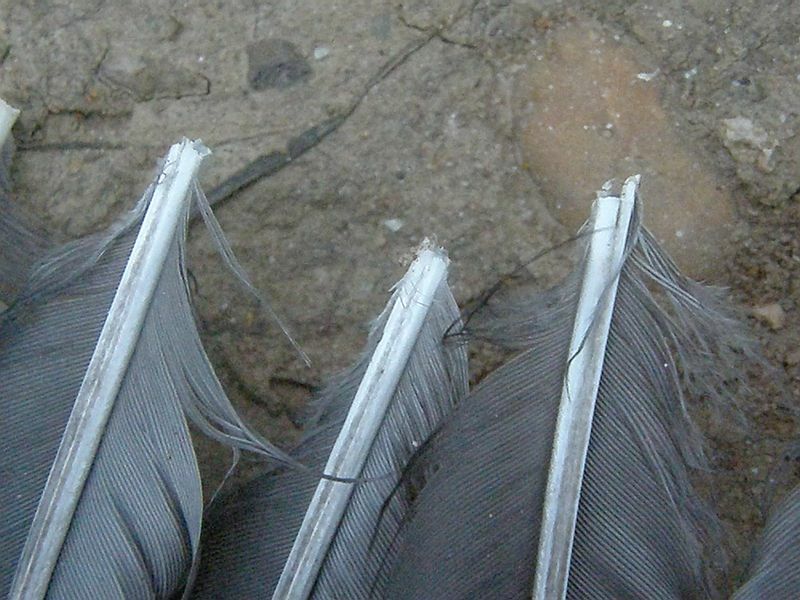 Both the Hamlyn Guide and Bang and Dahlstrom agree that bitten-off feathers are the work of a mammal. According to the Hamlyn Guide ‘Small carnivorous mammals, such as mustelids, bite the feather off so that most of the quill is missing. Larger carnivores pull out mouthfuls of feathers.’ Bang and Dahlstrom go one stage further and have an illustration of a feather that has been bitten off by a stoat (page 159), and it is identical to the ones that I found. I’m pretty confident based on the guidebooks that a stoat was the culprit here. Alongside the scats I found the other day, this is more evidence that a stoat is in residence in this corner of the field. Sooner or later I’ll catch sight of it. In the meantime I’m having great fun finding these little signs of its presence.